Everything Dinosaur’s work with photoshop and other platforms. Just a brief note to wish all our weblog readers, social media followers and customers a happy New Year. We wish everyone a peaceful, prosperous 2019. Team members at Everything Dinosaur have lots of exciting plans for the next twelve months, including adding numerous new prehistoric animal models to our range. We estimate that by the end of this year (2019), we will have added around fifty new prehistoric animal models to our inventory. We will also be updating our website and making some improvements to further aid navigation and enhance the website visitor experience. Happy New Year from Everything Dinosaur. From all of us, to all of you – Happy New Year. Everything Dinosaur has teamed up with their chums over at the YouTube channel of JurassicCollectables to bring dinosaur model fans news about which models from the Papo “dinosaurs” range are being retired. News may have already leaked out about which models Papo intends to release in 2019, Everything Dinosaur will make an official announcement soon about the new for 2019 models. However, in the meantime, here is a special press release in association with JurassicCollectables that provides information about which figures from the popular Papo range are being withdrawn. Papo model retirements in 2019. The Papo Allosaurus figure, along with the Papo running T. rex colour variant, Archaeopteryx, Tupuxuara and Dimorphodon are being withdrawn. The Papo Archaeopteryx, first introduced in 2014, is being retired, it has been left out of the 2019 catalogue. The Papo Tupuxuara, which came out in 2015, is also being retired, but it will feature in the new for 2019 Papo catalogue which will be sent out to distributors in January. It has officially been retired but has been included in the catalogue print run to permit what limited stocks that are left to be sold. The Papo Allosaurus model (55016), a stalwart of the range for many years is also being withdrawn. 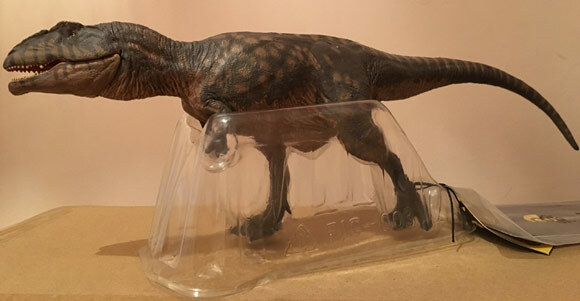 This figure is not in the 2019 Papo catalogue, it is being replaced by a new colour variant Allosaurus model. The Papo running T. rex colour variant (55057), which was introduced in 2016, has been retired. It too, is out of the new for 2019 catalogue, the idea is that whilst the green running T. rex will remain (55027), the first widely available colour variant will be superseded by the new, brown running T. rex model (55075). Furthermore, the Papo Dimorphodon model (55063) is being dropped. This flying reptile was added in 2017, but it is not included in the new catalogue and it has been withdrawn. Some further news for fans of the Papo range, despite the introduction of a new colour variant Stegosaurus model (55079), the original Stegosaurus figure (55007), is still in the 2019 catalogue. Everything Dinosaur team members have speculated that it has been included for the time being, but it will most likely be withdrawn in the future. Papo Stegosaurus (original) and the green running T. rex. Subscribers to Everything Dinosaur’s regular newsletter have been kept up to date with all our special offers for Christmas. In addition, newsletter readers have had the chance to reserve the new for January 2019, Rebor limited edition “Club Selection” Hatching Baryonyx “Hurricane” as well as to ensure they are amongst the first in the world to receive the forthcoming Eofauna Scientific Research Giganotosaurus scale model. Countdown to Christmas! Everything Dinosaur offers the Rebor “Vanilla Ice” tyrannosaurid figures Mountain and Jungle as a pair. Everything Dinosaur stocks the full range of these amazing 1/6th scale, Beasts of the Mesozoic articulated dinosaur figures, including the difficult to acquire accessory sets and the build-a-raptor kits. The Beasts of the Mesozoic dinosaur figures are targeted at discerning replica and figure collectors. All the figures are hand-painted and articulated and these prehistoric animal models are great to display. Everything Dinosaur is the exclusive European distributor for the Beasts of the Mesozoic range of models. Beasts of Mesozoic figures available from Everything Dinosaur. The Everything Dinosaur December newsletter also featured an update on the articulated, very rare, Kaiyodo Sofubi Toy Box Tyrannosaurus rex figures from Japan. All three colour variations including “smoke green” and the “classic” colouration are still available, but stocks are getting low. Safely arrived at our warehouse is a new soft toy, a wonderful example of Palaeozoic plush! We have a cute and cuddly Trilobite soft toy in stock. The soft toy Trilobite measures a fraction over 16 centimetres in length and we know the eyes are wrong (Trilobita had compound eyes), however, the soft toy is so wonderful we had to add it to our soft toy range. Kaiyodo Tyrannosaurus rex figures and a soft toy trilobite. Our newsletter also featured an update on what is coming out early in 2019. Our reserve list for the forthcoming (January release), Rebor Club Selection limited edition hatching Baryonyx “Hurricane” has now opened and subscribers have been given VIP access to this figure, after all, only 1,000 “Hurricanes” have been made. Team members promise to set aside figures for list members and then email them to let them know that their hatching Baryonyx is available to purchase. Reservation lists open for new dinosaur models. Furthermore, our December newsletter featured an update on the eagerly anticipated Eofauna Scientific Research 1:35 scale Giganotosaurus model. This beautifully crafted model is also due to arrive in January. A reserve list has been opened and Everything Dinosaur customers have been urged to let us know their requirements to avoid disappointment when this figure is released. There are only eleven more shopping days to Christmas, but with Christmas falling on a Tuesday this year, this means that there will be little movement in the international and domestic mail network from the 22nd December onwards. Customers are advised to order early to avoid any potential disappointment on the big day. Last recommended posting dates for Christmas (Royal Mail) in 2018. The table above has been put together using information from Royal Mail. Whilst staff at Everything Dinosaur do all they can to send out goods promptly and to provide accurate information on posting dates, it is certainly worthwhile checking with Royal Mail and other national carriers to obtain the latest postal information and updates. Please note, the dates highlighted in the table above, are the last recommended dates for posting. It is always sensible to send out gifts as early as possible in order to avoid disappointment. Postal services get very busy in the run up to Christmas, posting early is always prudent and rest assured, our staff will be on hand to help customers with any queries or questions that they might have. Everything Dinosaur working hard to manage Christmas deliveries. Team members at Everything Dinosaur have been working all weekend to ensure that orders placed for Christmas delivery get packed and sent out as rapidly as possible. Extra collections have been organised to cope with the large volume of orders the UK-based company receives at this time of year. Orders placed before 2.30pm each afternoon will normally be despatched by 5.30pm the same afternoon (5.30pm is the last scheduled collection of the day). Everything Dinosaur personnel have also been organising a special collection service to make sure that any last minute gifts get sent on their way as quickly as possible. Royal Mail have stated the last recommended posting dates for UK parcels (see table above), however, if you are waiting for a gift to arrive, it is worth remembering that there are a number of areas in the UK where extra deliveries are taking place and Royal Mail has also organised Sunday deliveries in many parts of the country, especially in cities. There are lots of things that customers can do to help ensure that parcels are delivered promptly. For example, prior to finally hitting the “submit” button, it would be very sensible just to check the zip/post code and to ensure that the house name or house number has been included in the delivery address information.